If this isn't the cutest thing I've ever seen! 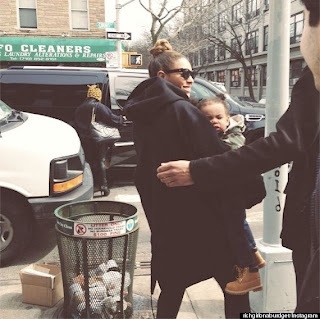 Beyoncé stepped out with 1-year-old daughter Blue Ivy for lunch at Buttermilk Channel restaurant in Brooklyn on Sunday. Beyoncé, wearing a black, wool jacket and sunglasses, carried a sleepy Blue Ivy, wearing an army fatigue jacket, blue jeans and a pair of Timberland boots. The photo was originally posted by a fan on Instagram. SIDE NOTE: Is it me or is Blue Ivy growing up ridiculously fast and aren't her tiny Tims adorable?! Omg, I can't take it. She's already a fashionista in the making.